SAN DIEGO, Calif. (CBS 8) - Big Brother will soon be walking the beat. The next time you get stopped by a cop, there could be a camera watching your every move. It's a new high-tech tool for crime fighters - a "head camera" worn by cops that can capture confrontations between law enforcement and potential suspects. It's called the Taser Axon, created by the makers of the popular stun gun, who have now supplied the San Diego Police Department with nine cameras as part of a 60-day trial. "The idea behind them is to allow us to capture real-time information at crime scenes," Asst. Chief Bob Kanaski said. It resembles a helmet cam used on video games, able to capture and store up to eight hours of audio and video. "What you are seeing is what the officer is truly perceiving at the time from a visual perspective, audio perspective, and that is invaluable," Jim Halsted of Taser Axon said. It's especially invaluable in situations like officer-involved shootings or alleged police brutality, providing videotaped evidence to either expose cops behaving badly or clear an officer who is falsely accused. "Our hope and desire is to take away some of that ambiguity of these police incidents and add clarity to complaints that may occur," Halsted said. 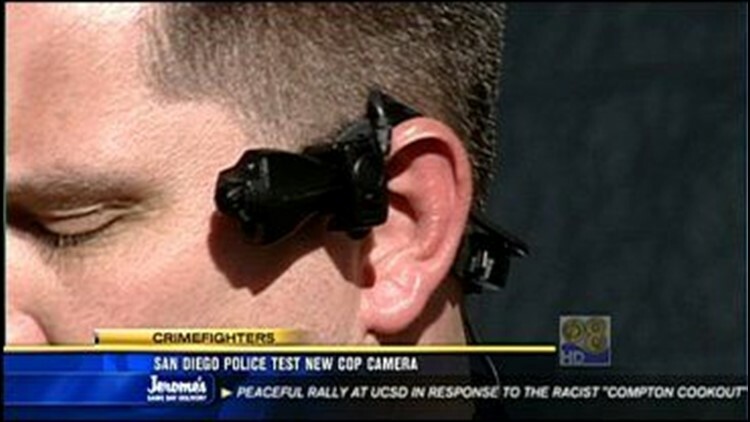 The new head-cams, which are also being tested by police departments in San Jose, Davis and Cincinnati, also have their critics. Privacy advocates say it's a case of Big Brother going too far, but authorities say they're following the letter of the law in using the cameras.